Trump politics, scare tactics and falsified facts are finding their way into the race for the OH-16, leading to the next Pro-Trump/Anti-Trump battle for a seat in Congress. 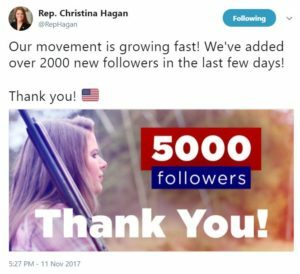 State Rep. Christina Hagan of Stark County, is notorious for leading the charge against women’s reproductive health in the Ohio House. She has now set her sights on becoming the next representative for OH-16. Drawing on the insurgent approach that allowed President Trump to take the White House in 2016, Hagan is pitching herself as a political outsider and embracing Trump’s far-right, fear-mongering tactics, hoping to scare Ohioans into voting for her. 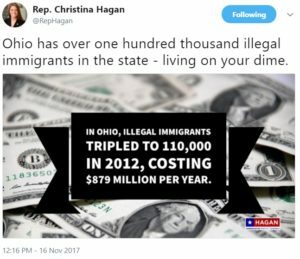 Recently on her Twitter feed Hagan cited a “study” conducted by the Federation for American Immigration Reform (FAIR) that claimed Ohio was losing nearly $1 billion a year because of undocumented immigrants. The Southern Poverty Law Center (SPLC) has debunked FAIR’s research on this subject, and has also called out FAIR for being an extremist group with racist leaders who have “ties to white supremacist groups and eugenicists,” according to the SPLC website. FAIR is known for the racist connections and their flawed analysis, but that doesn’t seem to have stopped Hagan from citing them as fact. Citing falsehoods is not where Hagan’s resemblance to Trump’s campaign ends. She is also picking up endorsements from key members of Trump’s campaign. She recently garnered the support of controversial conservative radio host Joe Walsh and the Trump constituency group, Vets for Trump. However, no endorsements have been quite as big as those of Dr. Sebastian Gorka, former Trump Strategist, and Pastor Darrell Scott, CEO of the Trump’s National Diversity Council. The duo is planning to headline a fundraiser for Hagan on Monday, Dec. 18. 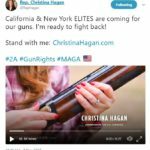 The event page states, “Pro-Trump, anti-Establishment forces will headline a campaign rally on Monday, December 18, 2017, for current state representative Christina Hagan in support of her congressional run for OH-16.” The event is also said to feature a surprise special guest that one can only assume will fall into the pro-Trump, anti-establishment camp. While Hagan has taken to Trump anti-establishment tactics, her closest opponent in the primary race has taken a more traditional approach. Anthony Gonzalez, former Ohio State and NFL football player, has drawn early support from major donors in district, including the Timken family. He has also received donations from former NFL quarterback Peyton Manning and Cleveland Browns owner Jimmy Haslem. In November, Gonzalez received praise for his fundraising and campaign efforts from the Republican Congressional Committee, the political arm of U.S. House Republicans. It is becoming apparently clear that this race is shaping up to be like the other Republican races seen throughout the country. Both candidates have chosen their approaches for making it out of the primary. Hagan has chosen to go full anti-establishment, emphasizing socially conservative policies, and soliciting support from pro-Trump figures. Gonzalez has chosen to go the path of gaining the support of renowned republicans and raising money. The candidates will continue to battle it out until the primary election on May 8, 2018.